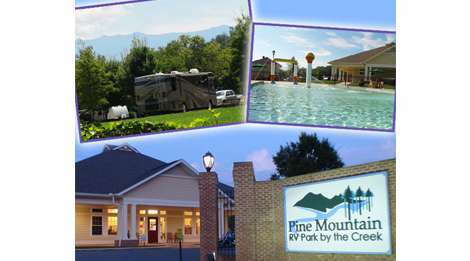 We have excellent facilities at Pine Mountain RV Park. Our park is newly built, so we have all the best modern amenities like: Concrete Level Sites, Paved Roads, Free WIFI (wireless internet), Cable TV Hook-up, Full Hook-up (Water, Sewer, and Electric), Picnic Tables, and Fire Rings. Our guests have the choice in 20, 30, and 50 amp electrical hook-ups, access to onsite bathrooms and showers, and the convenience of a guest laundry room. We have Back-in Sites that range from 30 ft/length to 50 ft/length, Pull through Sites that range from 30 ft/length to 45 ft/length, and Premium/ Creek Side Sites that range from 55 ft/length to 60ft/length. As an added bonus to camping at Pine Mountain RV Park, we have a Splash Pool with a zero entry side, 3 splash toys, and a large sun deck. We don’t take tent camping, but anyone from Pop-up Campers to Conversion Busses is welcome. We are Big Rig Friendly, and a Good Sam’s Park.